Duke helped the NCAA TOURNAMENT ratings. CBS: Anchored by an early Duke vs. North Dakota State game, the 1.9/1.3/1.1 preliminary numbers for Friday’s primetime NCAA TOURNAMENT were better than last year’s 1.2/1.2/1.1. ABC: FRESH OFF THE BOAT held at 0.6, and SPEECHLESS gained 0.1 to 0.5. 20/20 was up 0.2 to 0.9. 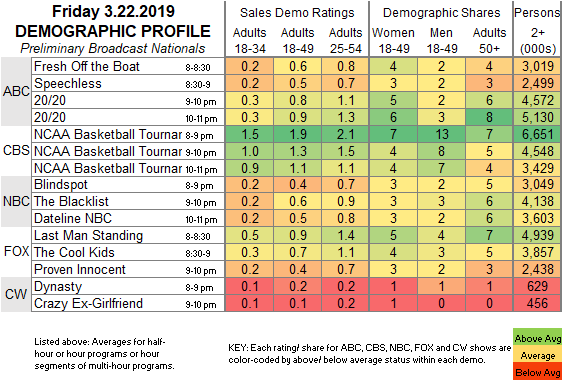 NBC: BLINDSPOT fell 0.1 to 0.4, while THE BLACKLIST rose 0.1 to 0.6. DATELINE remained at 0.5. FOX: LAST MAN STANDING (0.9), THE COOL KIDS (0.7) and PROVEN INNOCENT (0.4) were all steady. CW: DYNASTY was up 0.1 to 0.2, and CRAZY EX-GIRLFRIEND stayed at 0.1. Tonight, CBS’s continuing NCAA TOURNAMENT coverage faces off with NBC’s FIGURE SKATING CHAMPIONSHIPS. On Sunday, INTO THE BADLANDS returns to AMC for its final stretch of episodes.